© Damien Hirst and Science Ltd. All rights reserved, DACS 2015. Photographed by Rick Jenkins and Donald Thompson. This work comes from The Last Supper portfolio. The 13 screenprints in the portfolio are based on specific pharmaceutical packets chosen for their designs rather than for the specific properties of the drug. 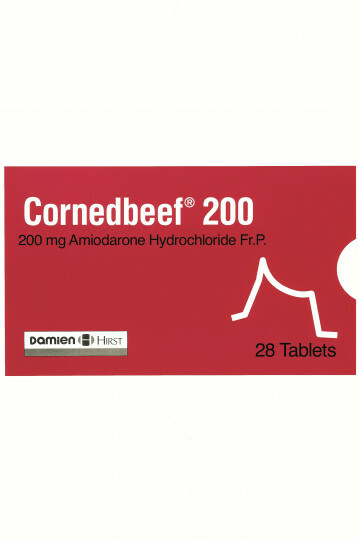 The image is based on a box of Corarone, a drug used in the treatment of cardiac problems. This packaging was in use at the time the work was made in 1999. This Hirst photocopied, indicated the changes to the text and other details, and passed the instructions to Jonathan Barnbrook, who had designed Hirst’s book I Want to Spend the Rest of my Life Everywhere, with Everyone, One to One, Always, Forever, Now(published by Booth-Clibborn Editions, 1997). Barnbrook created new versions on computer and the digital information was output onto full scale film. The screenprints were made from these films at Coriander Studios: each print was made from between four and seven separate stencilled screens and then varnished. The series was proofed and editioned at Coriander Studios, London and published by Charles Booth-Clibborn under his imprint The Paragon Press in an edition of 150.